Hello again, do you ever have a design in mind and find as you're busy creating, it totally changes? For The Joy of Sets Challenge this week I chose to use Flower Shop. 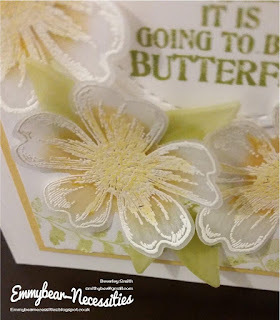 I used a gorgeous card I'd seen on Pinterest by Becky as my starting point. 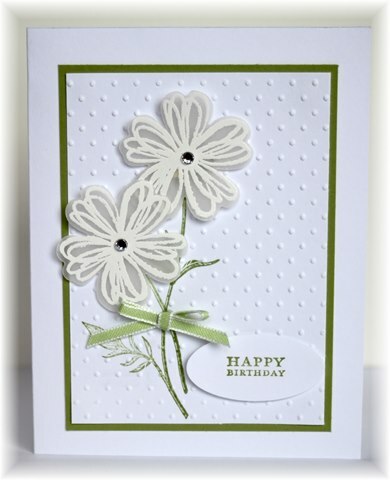 I love the simplicity and softness of this card; white on white with a touch of colour is so elegant. 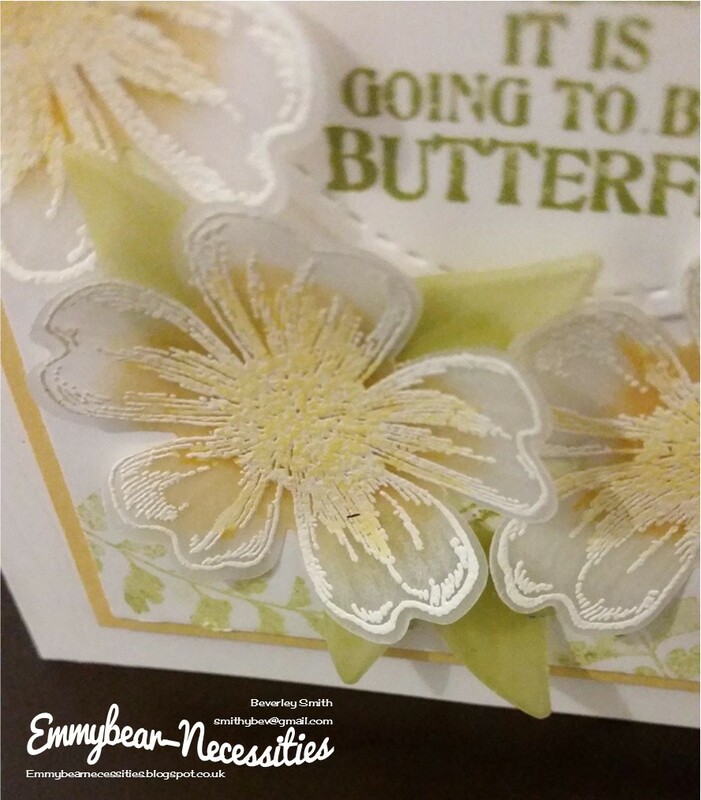 First of all, I used Versamark to stamp 3 flowers onto vellum before heat embossing in white. I coloured a piece of vellum with Pear Pizzazz before cutting some leaves using a leaf from Swirly Scribbles Thinlit dies. 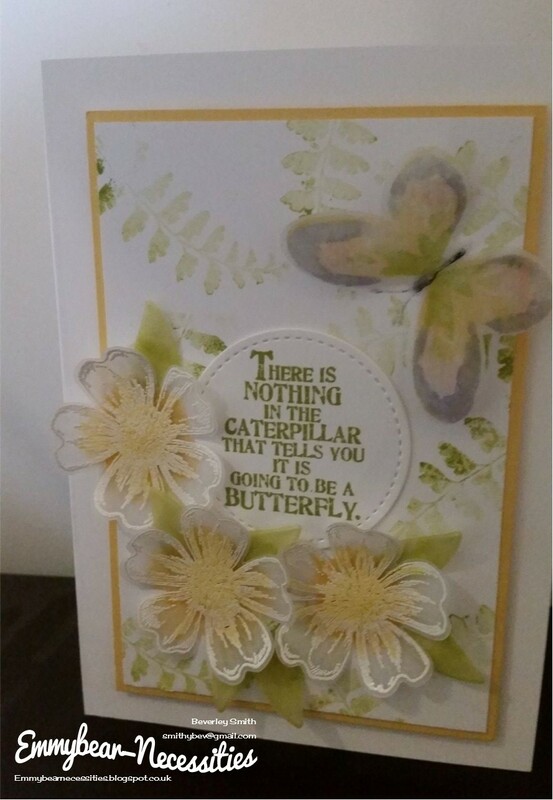 Using the smaller of the butterflies from Watercolour Wings I again stamped on vellum and die cut it out. The beautiful quote is from Butterfly Basics; I bought this stamp set specifically for the quote! It was stamped onto a piece of Whisper White card stock and die cut with a circle from the Stitched Shape Framelit die set. 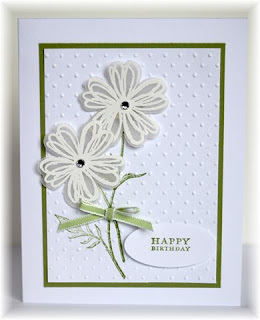 I also used the fern from this set to create a background, stamping off to get a paler version of Pear Pizzazz. As you can see from the close-up. my card has much more colour! There is a narrow border of So Saffron card which helps to tie in the colours. I'm really still not sure how I went from the card above to the one below! Yet another happy accident. It just shows that it pays to be open minded and experiment as you go along. Beautiful card Beverley! It's so delicate! Love it!! Thank you Susan. Really wasn't sure about this one, think it's different to my usual style.